Saudi Arabia—a key U.S. ally in the Middle East which also happens to be an armed-to-the-teeth absolute monarchy with a record of massive human rights abuses—is planning on moving forward with a $500 billion plan for a “new city state that would also straddle Jordan and Egypt in the kingdom’s northwest,” Arab News reported. The planned 10,230 square mile (26,500 square kilometer) business zone would be home to a city called Neom, with plans for it to “be powered by solar and wind energy” and likely “have more robots than people living there,” Arab News wrote. It’s part of an ambitious strategy to transition the kingdom from its historic reliance on its oil industry; falling oil prices have not hit Saudi Arabia terribly hard due to its massive financial reserves, but it does have to diversify in the future. 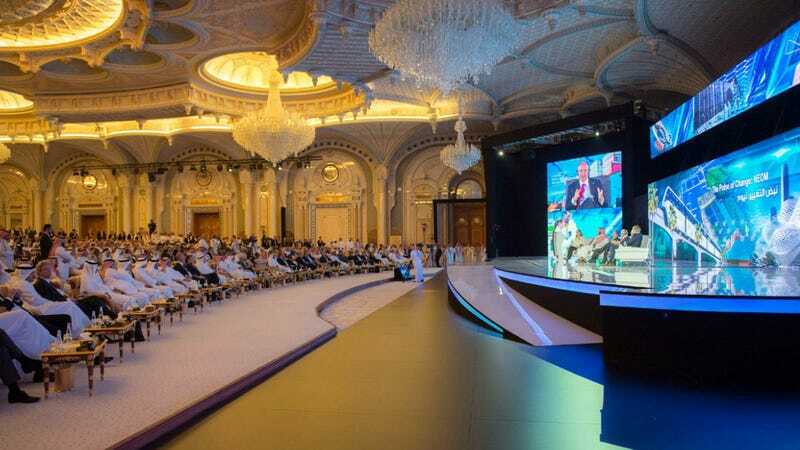 The crown prince has been talking about reform throughout the kingdom; at the conference, he also launched barbs at other members of the notoriously conservative monarchy, promising Saudi Arabia would once again become a “country of moderate Islam that is open to all religions and to the world.” According to CNBC, the zone “will have its own tax and labour laws and an autonomous judicial system.” As Quartz noted, the promotional campaign for Neom hints at increased freedom for women and a more open culture. Frankly, though, members of the Saudi ruling family have long enjoyed an undeserved reputation as reformers, like late King Abdullah bin Abdulaziz Al Saud, who enjoyed a blushing amount of hagiography after his death after a reign of heartless judicial oppression, brutish military intervention, and abuse of migrant workers. The country has made some progress in recent years, but it’s been tenuous at best. A $500 billion futuristic mega-city sounds nice on paper, but some of those outside investors might want to think hard about the possibility those promises are ephemeral, or a deliberate distraction. Unfortunately, they probably won’t.